I picked up a magazine at Target, with a Cartwheel discount, last weekend. I bought Real Simple, which is one of my favorites. 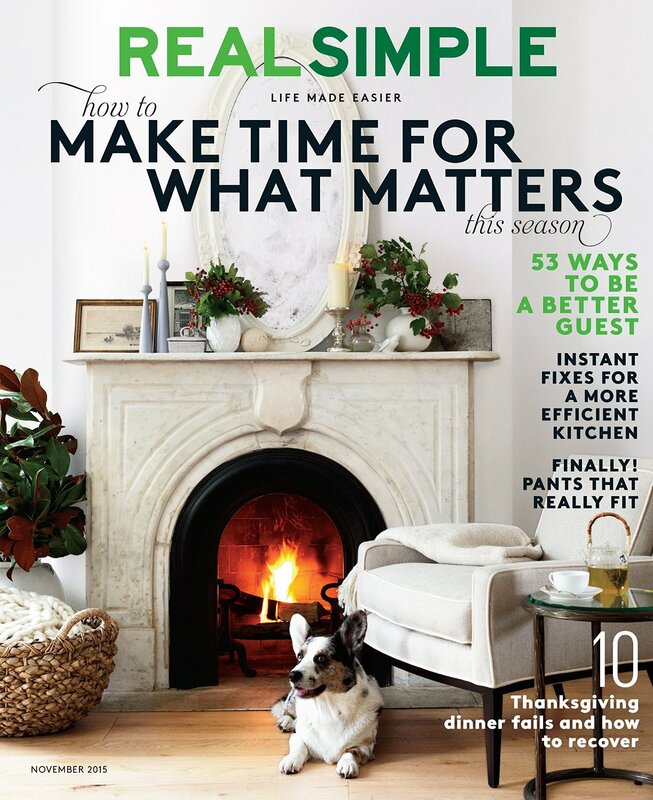 How to Make Time for What Matters This Season on the cover spoke to me. In addition to this type of magazine, I also favor travel, home decor and fashion ones. My favorite fashion one would be InStyle. When out, I used to buy a magazine regularly. It was a true simple pleasure for me. I grew up with a subscription to something, from American Girl to Seventeen. Most recently, I was subscribing to Budget Travel until they switched from print to being an e-magazine. I rarely purchase them anymore, maybe one once or twice a year. I am likely to buy one for the beach in the summertime. The January issue for O, The Oprah Magazine may inspire my new year's resolutions. On a trip, I might grab one at the airport or train station. I rarely get a magazine anymore for a couple of reasons. First, around $5 a pop, it's a rare indulgence for budget reasons. Second, I felt like I stopped reading fashion magazines so much when I read the book The One Hundred by Nina Garcia and became increasingly interested in cultivating my own style. I was further dedicated to only choosing a few pieces that are classic over trendy. Sometimes, fashion magazines portraying temporary fads were a disappointment and felt like a waste of money. I enjoyed reading the November issue last Monday afternoon, on my day off. I also look forward to finishing this out-of-the-ordinary treat over the next couple of days while taking vacation days, staying at my parents' place dogsitting the family dog Minnie. Unfortunately, I've had a cold for the past three days so hopefully I won't be flipping the pages in bed; I prefer a coffee shop, or at least on the sofa with a hot cup of tea. Hopefully, I'll wake up back to normal tomorrow. From reading this issue, I rearranged some food inside the refrigerator. I also thought the detailed guide on party guest etiquette was informative. Several pages of beautiful table linens was a bit more fun. It's a good issue. I recommend it. I hope you get this issue; it's pretty good. Because Jennifer L. Scott's "Polish Your Poise with Madame Chic" came out this week, I have temporarily abandoned this magazine. I will finish it soon though and even though I love to declutter, will at least keep it around, on the coffee table for guests, through the end of November. I used to be subscribed to everything...Elle, Vogue, Bazaar, W, and Allure and pick up others along the way. But the cost has become ridiculous, IMO. I now buy a few issues (more Wine & Food these days) with my Kindle....usually looking for the "0.99" deals or I splurge on the March and Sept issues. I looked for those 0.99 deals when I first purchased my Kindle, but haven't since. I should really consider that for travel, at least. A kindle is so much lighter than a magazine in my bag.